http://www.jeffjacoby.com/22340/to-soak-the-rich-keep-tax-rates-low Left-wing Democrats, including Elizabeth Warren, Alexandria Ocasio-Cortez, and Bernie Sanders, are clamoring for steep tax hikes on the wealthy.SOAK-THE-RICH tax schemes are in vogue on the left these days.Democratic Party heartthrob Alexandria Ocasio-Cortez made a splash last month when she went on “60 Minutes” and proposed a 70 percent marginal tax rate on incomes over $10 million. “People are going to have to start paying their fair share in taxes,” she said.From Senator Elizabeth Warren comes a proposal to levy an annual wealth tax on the net worth of American households with more than $50 million in assets. Vermont Senator Bernie Sanders has drafted a proposal to sharply increase the federal estate tax, imposing a top rate of 77 percent on estates worth more than $1 billion.The details of these plans differ. But all of them are premised on the belief that wealthy Americans don’t pay an equitable share of the tax burden, and that a more progressive tax code will not only be fairer but also raise more revenue.For some politicians, taxing the wealthy more harshly seems as much a matter of retribution as of fiscal policy. “The rich & powerful run Washington,” tweeted Warren as she released her tax plan. “It’s a system that’s rigged for the top if I ever saw one.” Sanders routinely inveighs against “the greed of Wall Street, the power of gigantic multinational corporations, and the influence of the global billionaire class.”Americans have traditionally been cool to such overt class-war rhetoric, but maybe that’s changing. Recent polls show broad support for raising tax rates on the very wealthy. A Hill-HarrisX survey in January found that nearly 6 in 10 registered voters favored raising the top income-tax rate to 70 percent. Strong majorities of Democrats (71 percent) and Independents (60 percent) backed the idea, and even 45 percent of Republicans expressed support. Other surveys have yielded comparable results, as Politico reported in a story headlined “Soak the rich? Americans say go for it.”Yet however popular it may be to claim that millionaires and billionaires don’t shoulder their share of the tax burden, it isn’t true. The federal income tax is highly progressive. The ultra-wealthy not only pay far more than their fair share in taxes, but the portion of the tax burden they shoulder has grown significantly in recent decades.Each year the Internal Revenue Service releases voluminous data on American taxpayers, sorting scores of millions of tax filers by adjusted gross income and share of income taxes paid. Each year the data confirm that while those at the top of the hill reap an outsize portion of the nation’s income, they pay an even more outsize portion of the nation’s taxes.Thus, in 2016, the top 1 percent of taxpayers earned 19.7 percent of all the income — more than $10 trillion — reported to the IRS. To put that in raw numbers, 1.4 million taxpayers (out of 141 million) reported $2 trillion in income (out of a $10.2 trillion total). But the top 1 percent didn’t pay 19.7 percent of federal income taxes. They paid 37.3 percent. In other words, while they earned somewhat less than one-fifth of all reported income, those in the 1 percent contributed somewhat more than one-third of all income taxes. According to the Tax Foundation, the top 1 percent paid roughly $538 billion in income taxes, considerably more than the $440 billion in income taxes paid by the bottom 90 percent.For the “tippy top” — the wealthiest one-10th of 1 percent — the disproportion is comparable. In 2016, the uppermost 0.1 percent of taxpayers earned 9.5 percent of all income, yet they paid more than 18 percent of all income taxes.By any definition, America has a progressive tax system.Could it be made more progressive? On paper, sure. Hiking the top marginal tax rate from the current 37 percent to the 70 percent urged by Ocasio-Cortez would represent a dramatic increase in progressivity. Even more dramatic would be to push the highest rate above 90 percent, where it used to be when Dwight Eisenhower was in the White House.However counterintuitive it might seem, there is an inverse relationship between marginal tax rates and the tax burden on the rich. As a rule, the lower the rates, the more the wealthy pay. (Chart: Carpe Diem blog)Liberals are fond of pointing out how much higher tax rates used to be. 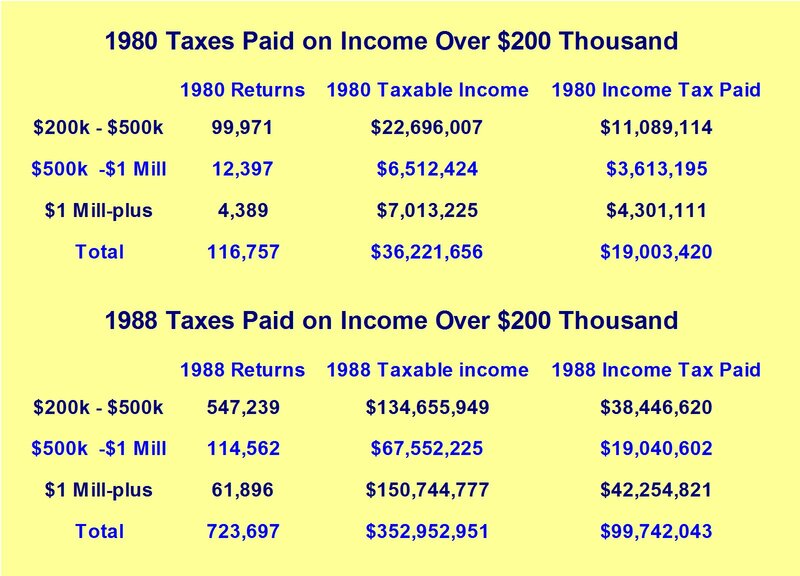 Unfortunately for AOC, Warren, et al., dramatically higher tax rates at the top didn’t result in dramatically higher tax revenues flowing to the Treasury. Throughout the 1950s, the effective tax rate paid by the “tippy top” was about 21 percent, barely more than the 19.7 percent paid in 2016. Wealthy taxpayers have many wholly lawful ways to avoid exorbitant tax rates, and routinely control the timing and content of their income to avoid them.More to the point, there is an inverse relationship between marginal tax rates and the tax burden on the rich. As a rule, the lower the rates, the more the wealthy pay. It may seem counterintuitive, but experience has shown again and again that the best way to “soak the rich” is to keep marginal rates low. When Ike was president, tax rates were indeed sky-high. Tax revenues weren’t. It was only after Reagan came along and chopped the top tax rate to 28 percent, however, that dollars came gushing in to the IRS. Class-war strategists may chafe at that, but it’s the way the world works. (Jeff Jacoby is a columnist for The Boston Globe).– ## —Follow Jeff Jacoby on Twitter. I am not good at Math and I know that what they are doing is wrong for the country. Especially 70 percent tax. That will ruin the middle class. They don’t understand basic math fundamentals. The rich will be paying more even if it is a low percent, such as 15 percent. The 70 percent tax is designed to control the middle class. The upper class will pay more, but so will the middle class. You could earn a Million Dollars and have to pay $700,000 which equals $300,000. Might as well not work!!!! Which is their goal anyway so that more people can apply for benefits (Medicaid, Food Stamps, Housing vouchers). Someone making 30,000 or 40,000 will have to take home around 9,000 or 10,000 a year!!!! The fix has been in for a long time. Has anyone noticed that benefit programs such as Obamacare reached higher income levels the past few years especially in certain states? IE Medicaid expansions? That is no coincidence as they try gradually try to build towards socialism. As I have said on Twitter and I will say it again here, our chances are at the ballot boxes. Anyone who is a conservative needs to vote in all local, state, and federal elections. Otherwise our Country will be going downhill and freedoms will be going away. We see it in New Jersey, New York and Virginia with “gun control” and then talking about abortions up to and including birth. We won the US Senate. We won Governorships. But we need to take back the house in 2020, and we need to keep the Senate and Presidency. The State and local elections are just important as well. Look at what Governor Northam is doing to Virginia!!!! Ed Gilespie was a failed moderate RINO. He was boring and he lost!!! !